← God has an interesting sense of timing. Bye Buy, Bruiser. I will miss you. My hubby noticed yesterday that two of my widowed parakeets are now in "love". Parakeets and other parrot varieties mate for life. My parakeet Beady has had two previous mates die: Miss Piggy only had one leg but her loving mate looked after her and fed her. After Miss Piggy died, he was alone for quite some time. 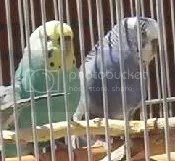 And, then later, he noticed Ziggy, who at that time was my oldest parakeet, yet had never had a mate. He was totally devoted to each of them as long as they lived. He’s been alone since then. My parakeet Gumby lost her mate, Monty, some time back. She’s been alone, too. Then, the last few days, I noticed that Gumby had been kicking the food out of the communal food dish in the parakeet cage. Every morning I’d fill it up, and it would be kicked out shortly after. That mystery was solved when my hubby noticed an egg in the food dish. Ah ha!! Substitute nest! The next day, which was yesterday, he noticed two parakeets mating and hollered out to me. I ran in to see who it was. 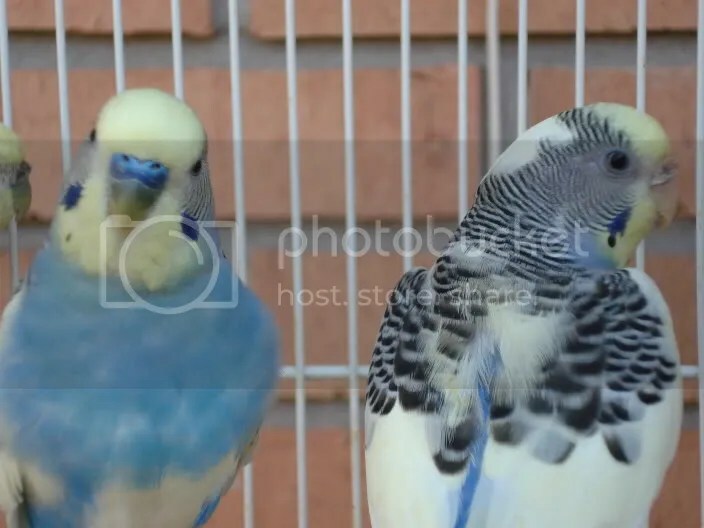 (only I know all their names – I’m the bird fanatic in the house) Birds do not have "relations" until they’ve made a commitment to stay together and raise the babies together. Some birds, like parrot types and geese, make a commitment for life. So, now I know that Beady and Gumby are officially a couple. What’s that you say? My life sounds boring? Well, it is sort of. I’ve been sick for over a year, and don’t get out much. being cooped up in the house all the time gets old. I spend a lot of time in my Lazy Boy chair. Having all my pets around me is a great comfort, and keeping track of their courtships helps keep life interesting.